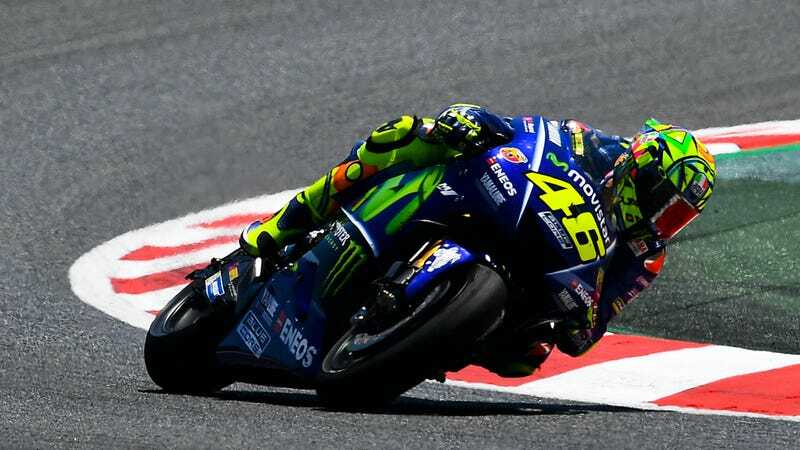 Nine-time world champion and MotoGP Yamaha rider Valentino Rossi was hospitalized Thursday due to an endurance motocross crash that fractured parts of his right leg, reports Motorsport.com. Sadly for those hoping this year would bring him championship number 10, he will take a while to recover. Rossi’s crash caused displaced fractures of the tibia and fibula on his right leg, which is the same leg that broke in a high-speed crash at Mugello in 2010. Doctors at Rossi’s hospital in Italy rushed him into surgery Thursday night, but despite Rossi telling Crash.net Friday morning that he “already felt good,” doctors believe it will take a while for Rossi to recover well enough to start riding again. The operation lasted one hour. We used a pin to stabilize the fracture. The leg is a bit swollen, and he will stay here for a few days before beginning physiotherapy immediately. Additionally, Pascarella confirmed that Rossi will remain in the hospital for three to four more days. All this time off will mean Rossi will likely miss the MotoGP rounds at Misano and Aragon. He currently sits fourth in the championship, so his hopes of getting another world title this year are significantly less. Ouch. This isn’t the first motocross oops Rossi has been involved with this year, however, that crash didn’t cause him to miss any races.